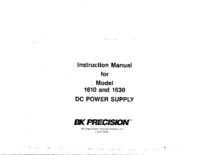 The B & K-Precision Model 1610 and 1630 DC Power Supplies are high quality, general purpose dc power sources. The two models are very similar to each other, and both are covered in this instruction manual. Each of these power supplies provides 0-30 volts dc output, adjustable with both coarse and fine controls for precise settability. The current output of the Model 1610 is 0-1 amp, while Model 1630 is 0-3 amps. Two current ranges, HI and LO, provide excellent current settability and meter resolution. 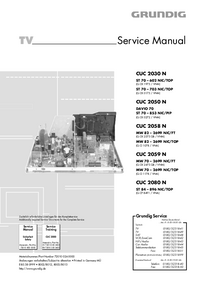 Two large panel-mounted meters continuously monitor the output voltage and current. These power supplies exhibit excellent regulation and low ripple characteristics. The circuit design incorporates a pre-regulator, which greatly reduces internal power dissipation at low output voltages. T^ie styling is both attractive and functional- The mechanical configuration conserves bench space and allows for easy portability. These instruments may be used in constant voltage or constant current applications. The crossover from constant voltage to constant current modes is smooth and automatic. LED’s indicate the ”CV" (constant voltage) or ”CC" (constant current) mode of operation. In constant voltage applications, a current limit may be preset. When load variations cause the current to reach the preset limit, the unit then regulates output current rather than output voltage. Current limits are adjustable from 5% to 100% of maximum. In constant current applications, the maximum voltage may be preset. When load variations cause current to drop below the regulated value, the unit reverts to regulated voltage operation at the preset value. Reverse polarity protection prevents accidental damage to the Power supply from improper connection to an external voltage, and current limiting protects the equipment being powered, as well as the Power supply. The output is isolated from chassis and earth ground, which permits full flexibility of connections. When needed, the (+) or (-) polarity may be strapped to ground, or either polarity may be floated to an external voltage. 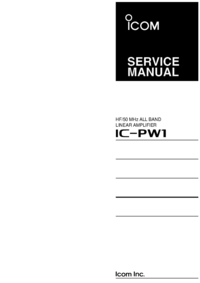 Two supplies may be connected in series as a 0--to-60 volt power source, or two supplies may be connected in parallel, with suitable balancing resistors, for up to twice the output current. These power supplies are well suited for a wide variety of electrical and electronics applications, including service shops, engineering labs, production testing, school laboratories, and home use by hobbyists. 0-30 VOLTS Continuously variable over 0~to-30 volt range with coarse and fine controls. 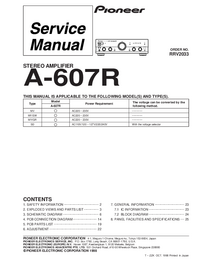 0-1 AMP AND 0-3 AMP VERSIONS 0-to-l amp (1610) and 0-to-3 amp (1630) models available. Each rated for continuous duty at full output current. LABORATORY QUALITY Excellent regulation, low ripple. CONSTANT VOLTAGE OR CONSTANT CURRENT Provides regulated dc voltage output or regulated de current output. Crossover is smooth and automatic. TWO CURRENT RANGES Hl-LO switch selects full output (0-1 A for Model 1610, 0-3 A for Model 1630), or half output (0-0.5 A for Model 1610, 0-1.5 A for Model 1630). LO range improves current settability and meter resolution at lower current values. Switch simultaneously selects range of adjustment and corresponding meter scale. BUILT-IN METERING Two large, easy-to-read meters continuously monitor output voltage and current. LED INDICATORS Act as pilot light and identify mode of operation. PRE-RBGULATOR Limits internal dissipation for higher reliability. ISOLATED OUTPUT Either polarity may be floated or grounded. OVERLOAD PROTECTION Fully adjustable current limiting (from 5% to 100% of maximum output current) protects circuit under test and the power supply. REVERSE POLARITY PROTECTION Prevents damage to Power supply from external voltage of reverse polarity. STYLING Modern functional styling. Configuration conserves bench space and aids portability. Logical, convenient layout of controls. HOOK-UP CABLES Supplied with red and black hook-up leads.